Carol E. Sliper, 80, of Great Falls, went to be with her Lord on April 12, 2019. O’Connor Funeral Home is handling the arrangements. Visitation will take place at O’Connor Funeral Home on Friday, April 26 from 3:00 to 5:00 p.m. Interment will be on Saturday, April 27 at 9:30 a.m. at Highland Cemetery followed by a memorial service at Northwest Family Fellowship at 11:00 a.m.
Carol was born in Detroit, Michigan on September 10, 1938 to Emma “Betty”and Gerald Smith. She graduated from Great Falls High School. Carol had three children from her marriage to Joe Love: Janell, Rich and Karyn. She married Jim Sliper in 1985, and became step-mother to Boyd, Colleen and Joe. 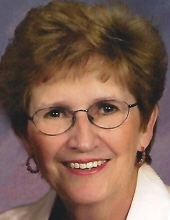 Carol worked for the Great Falls School District and the Deaconess Hospital before selling Home Interiors. As a child, she enjoyed gardening with her grandmother, from whom she gained her love for antiques. She also enjoyed playing the piano and travelling with Jim and their dogs in their motorhome throughout the U.S. and Canada. She was very active in her church, where she was a pianist for many years. Carol was preceded in death by her husband, Jim. She will be greatly missed by her sister, Lea Little; children and step-children Janell Love, Rich (Carolyn) Love, Karyn (Stefano) Dona, Boyd (Marlys) Sliper, Colleen (Jack) Rosenberg, and Joe (Kate) Sliper; as well as her ten grandchildren. In lieu of flowers, please consider donations to the Great Falls Rescue Mission, or a charity of your choice. To plant a tree in memory of Carol E. Sliper, please visit our Tribute Store. "Email Address" would like to share the life celebration of Carol E. Sliper. Click on the "link" to go to share a favorite memory or leave a condolence message for the family.